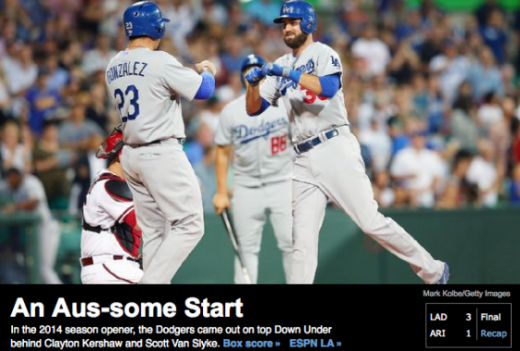 Photo: The home page of major American sport broadcasting network ESPN as it was on Saturday 23rd March. TTN: A crowd of 30,000* were drawn to the American 2014 Major League Baseball (MLB) opening game held in Sydney. The credibility of the ‘expected viewing audience of 165m’ figure touted by promoters to Australian media is in doubt after the MLB dubiously called Channel 9 ‘the highest-rated Australian network‘ in their press release to American media. The match appears to be a token in the way that an ‘official opening’ is of a restaurant. Respected American television marketing information distributor TVByTheNumbers doesn’t even list the Sydney Dodgers/Diamondbacks game as part of ESPN’s American broadcastings big ‘opening day/ opening night’ schedule. The Sydney exhibition match is the beginning of a 25-year broadcasting deal for Channel 9. The SCG and Australian sports management teams though, may not be up to the challenge; The New York Times is reporting that a team bus had a flat tire, and the Diamondbacks said a handful of players decided to walk the last half-mile to the stadium instead of waiting for a replacement bus. The SCG have not extended their media operations to release up-to-date crowd information or photos of the event, missing opportunities for major international media. The 23rd March game is the earliest an MLB season opener has ever been played, accommodating for player travel. ESPN said “The ceremonial first pitch was thrown by Sydney Swans Aussie rules football star Adam Goodes, picked as Australian of the year this season.” No Australian major media carried a photo of Adam Goodes’ pitch. The ABC reported that the game was set to ‘inject $13m into the NSW economy’, dwarfed by the paypacket of LA Dodgers’ star pitcher Clayton Kershaw is on a seven-year, $215m contract. 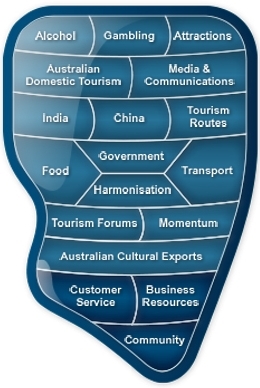 From a tourism perspective, it was disappointing that Channel 9’s 4-hour broadcast to Australian viewers included only a handful of shots of Sydney, but normal commercial breaks did broadcast Destination NSW ads to at least Sydney viewers. The ESPN website marvelled at the cost of food at the SCG, saying ‘If you could afford the cost and the calories, a 2-foot-long hot dog sold for $36’. See the Major League Baseball organisation’s press release on the game from February here. THE big corporate social event this weekend is not an AFL or rugby league game but the clashes between the LA Dodgers and Arizona Diamondbacks at the Sydney Cricket Ground. Corporate leaders attending the games on Saturday night and Sunday, which will mark the opening of Major League Baseball’s 2014 season, include Business Council of Australia head Tony Shepherd, Jack Cowin, Fairfax board director and chief executive of Competitive Foods Australia, ESPN Australia chief Gus Seebeck, Publicis Mojo’s new chief executive Andrew Baxter, the former US ambassador to Australia and now consultant to the Visy group Jeff Bleich, and News Corp Australia senior executive Brett Clegg. The SCG, which has been turned into a field of dreams, complete with red clay and dugouts, at a cost of more than $1 million for the weekend’s games, ITwill also host representatives from companies including Foxtel, sports/business firm SportsConnect and Repucom. While Major League Baseball (so important that you drop the “the” when you talk about it) is probably losing money on its decision to start the 2014 season in Australia, these games are all about the push to internationalise the $8.5 billion business that is North American baseball. Baseball is big in Japan and South Korea, but having exposure by another visit to the Asian time zone will help expand the game’s image as an international sport — and could well provide an expanding talent pool of Australian players headed to play in the US. 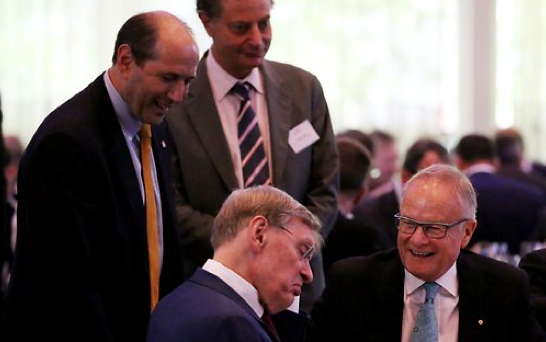 Mr Shepherd, who is also chairman of AFL newcomers Greater Western Sydney Giants, yesterday hosted a star-studded sports and business lunch at the Ivy in Sydney, where he interviewed MBL commissioner Allan “Bud” Selig, who talked about the importance of internationalising the game. Other guests yesterday included Crescent Capital chairman David Mortimer, former Wallaby Simon Poidevin (now an executive with Bell Potter Securities), former Australia cricket captain Steve Waugh, and Australian Baseball League chief executive Peter Wermuth. Other companies represented included Australia Post, Suncorp, Lion, Harvey Norman, Qantas, NAB, Coca-Cola Amatil, BDO, Carnival and Mazda. “Baseball is a sport that Australians know well from television and movies,” Mr Shepherd, who lived in the US for three years, said after the lunch. “It resonates with Australians. To go to a baseball field is an experience that’s like going to the SCG. It calms you. It gets you ready for a great sporting contest. Mr Shepherd said staging the two weekend games would “have a remarkable effect” on the business of baseball in Australia, which was boosted in 2010 when MBL reorganised the game here through a 75 per cent-owned subsidiary, the Australian Baseball League. The eight ABL clubs have spent a record $3m on sign-up bonuses for 16 and 17-year-olds to join the league. “Baseball is doing well in Australia and I think it will do better,” said Mr Shepherd, flush from Saturday’s surprise Giants win over the Sydney Swans. MBL has started its season overseas before, in strong baseball markets such as Japan and Latin America, but coming to the small market such as Australia is a financial risk. And two long flights at the start of the season has not gone down well with some players, including Dodgers pitcher Clayton Kershaw. One Los Angeles-based commentator, Trevor O’Brien, complained that “Dodgers Down Under sounds like the title of a silly straight-to-video movie sequel that plays on Disney Channel”. “The league is not getting quite the ‘rah rah’ response it might wish from the stars in Los Angeles,” he wrote last month, complaining that LA viewers would have to watch the first game at 1am Pacific time. But at yesterday’s lunch, Mr Selig diplomatically suggested that those in the game who were not quite happy at the long trip should be prepared to make a “short-term sacrifice” for “what’s in the best interest of your sport”. “This weekend is a chance to grow the game internationally,” Mr Selig said. In the US, MLB’s income has been significantly boosted by a recent deal with Fox Sports, ESPN and TBS, which will pay $US12.4bn ($14bn) for the TV rights from 2014 to 2021, more than double the amount paid for the rights from the previous period from 2006 to 2013. MLB has also been expanding its income with the launch of its own television network and a digital marketing business called MLB Advanced Media. The LA Dodgers, which were sold for a record $US2bn two years ago, also have a deal with Time Warner Cable for a regional sports network called SportsNetLA that is estimated to be worth more than $US7bn over 25 years.